The figure was to be named Goldar, and was built from He-Man's head, torso, and legs, Jitsu's arms, and Fisto's armor. My drawing is pretty accurate to those details. I deviated a little, attempting to mimic the style of the Fuerza-T card art. This piece is not part of my "regular" series of Masters of the Universe drawings, as it deviates from my usual modus operandi, and was done for a specific purpose that COTU has in mind. The coloring, for example, is a blended style, as opposed to my usual cel-shading. A more J.Ho-ized version of Goldar (and the rest of the Fuerza-T cast) will come in the future. 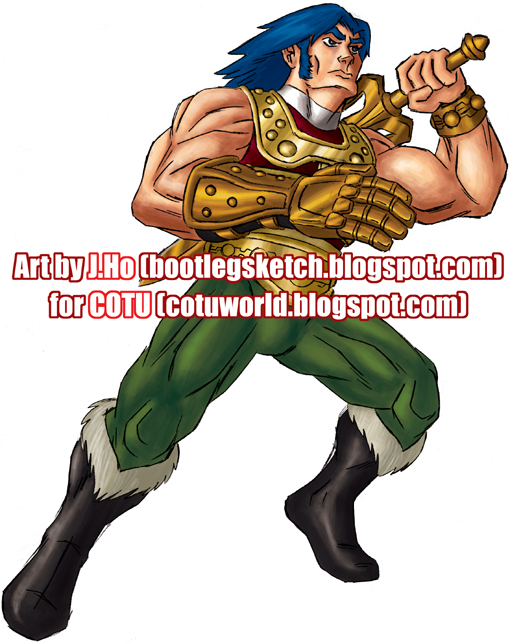 Check out COTU World blog for some photos of their excellent He-Man customs (on the links list on the sidebar... or if you can't be bothered, click HERE). the colors on this are gorgeous. the pose very action-y. indeed ur best work thus far on these posts.